There has been a long fight against the building of a new Pickering airport for Toronto. In their 40-plus years of struggle against a development – in a growing suburb to the east of the city – many citizens feel priority is given to business interests over prime agricultural farmland. Until a firm and unequivocal commitment is made by Ottawa to abandon the project completely the citizen activists central to the struggle to halt the development can never be sure the project won’t find new life, at some distant moment, under yet another government. Most frustrating for those who oppose the project is that in their view there has never been an adequate explanation for why Pickering needs its own Mirabel, a Greater Toronto Hamilton Area equivalent of Montreal’s white elephant airport that has become synonymous with poor air transport planning in Canada. “Land Over Landings” is the community group that leads opposition to the airport plan. It is continuing the public engagement their predecessors began in 1972.They say that clean water and local food will always be more vital than easy access to yet another area airport. Most frustrating for those who oppose the project is that in their estimation, no one, in more than 40 years of discussion, has presented an adequate explanation for why Pickering needs its own Mirabel, a Greater Toronto Hamilton Area equivalent of Montreal’s white elephant airport that has become synonymous with poor air transportation planning in Canada. Sandra C. Budden, an active member of People or Planes, wrote an editorial for Alternatives Journal’sFall 1972 edition as part of the group’s effort to educate the public about the project; the piece details the history of the struggle, explaining why the airport protest had nothing to do with property values or preserving unobstructed views. Pickering airport gets green light, but is it needed? Aviation experts question the need, arguing demand isn’t there and airlines wouldn’t want to duplicate Pearson operations. A woman wears a protest button from Land over Landings, a 40-year-old movement against a Pickering airport, while demonstrating against the revived plan. The group was not allowed near the official announcement site Tuesday as Finance Minister Jim Flaherty announced that, along with a transfer of federal land to the new national Rouge Park, some would be set aside for an airport. After being parked on the tarmac for more than four decades, plans to build an airport in Pickering have suddenly been solidified by the federal government — a move sparking renewed debate over whether another airport is needed. Finance Minister Jim Flaherty made the surprise announcement Tuesday at an event to mark the creation of the Rouge National Urban Park. Aviation industry officials say they were given no advance notice of the plan, and Ontario Transportation Minister Glen Murray said he was caught off-guard. Murray, who was on hand for the park’s soil turning, said in an interview that he had just finished thanking Flaherty publicly at the event when the airport bombshell landed. “They announced they’re proceeding with the Pickering airport in some fashion without great clarity, without any heads-up, without any kind of consultation with us, which makes it hard to work together,” he said, adding that Ottawa is “blindsiding” the province. “Minister Murray is mistaken. 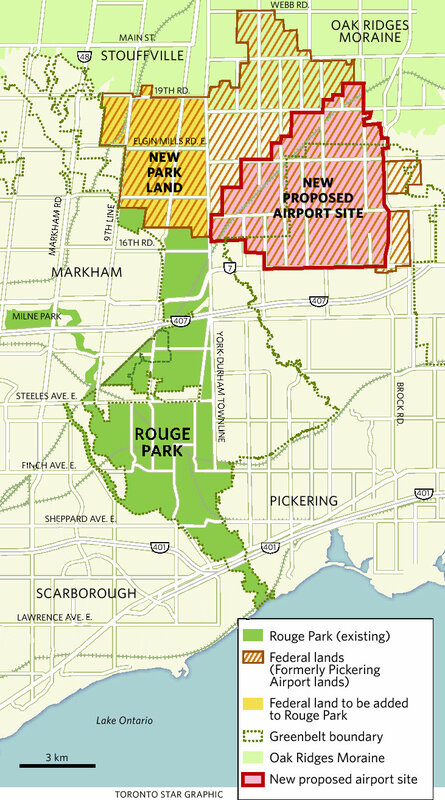 He should check with his officials, because for more than a week documents have been going back and forth with respect to the airport and the lands to be used for the park,” Flaherty said. “He is not up to date on what is going on in his own government,” he said. The Pickering lands, which include more than 7,500 hectares expropriated in 1972 for an airport, would be carved up into three sections, though no specific breakdown was given. In his remarks, Flaherty referred to the looming closure of the Buttonville airport as well as a needs assessment study conducted by Transport Canada, released in 2011, that said the region will outgrow Pearson as well as secondary airports in Hamilton and Waterloo by 2027 at the earliest, and possibly as late as 2037. Flaherty also noted that the Pickering airport, 56 kilometres from downtown Toronto, will fit in nicely with plans to expand the toll Highway 407 eastward to Highways 35 and 115. But aviation analysts argue another airport simply isn’t needed at this time. Even though many cities around the world, such as New York and London, have several airports within their metropolitan areas, Lazar argued the Greater Toronto Area doesn’t have the population base. Plus, airlines would be reluctant to split services and operations between Pearson and Pickering. Pearson spokesman Scott Armstrong said the airport handled 35 million passengers last year, up 4.4 per cent from a year earlier, and there were 433,000 takeoffs and landings, up 1.2 per cent. “Over the next 15 or 20 years, we could get to 60 million passengers, but long-term planning is far from an exact science,” Armstrong said, adding that Pearson is focused on using its existing infrastructure before considering any additional projects, though it can build a sixth runway if needed. Armstrong said Pearson, which operates as a not-for-profit private company, is still growing, adding new carriers, including Russia’s Aeroflot and EgyptAir this month alone. By contrast, the three main New York area airports handled more than 120 million passengers last year. Robert Kokonis, an analyst with AirTrav research firm, said Pickering would essentially be the fourth commercial airport in the region, including Hamilton and Toronto’s island airport, where Porter Airlines hopes to expand its operations. If Porter, which wants to fly Bombardier’s new CSeries jet to cities such as Vancouver and Los Angeles, wins permission, other carriers, such as WestJet and Air Canada, will also want slots there, he said. While airports aren’t built overnight, Kokonis argued that master plans are full of economic assumptions — “a mug’s game” this far out in time. “It’s an awful lot of money to build a new airport,” he said, adding the federal government could use some of that money to offer rent relief to Canadian airports to make them more competitive with U.S. airports, which have been drawing loads of Canadian travellers in recent years. Kokonis argued that Hamilton could also be developed more, especially because it has no curfew, so planes can take off and land around the clock, unlike Pearson and the island airport. All three main Canadian carriers declined to comment, saying they had too little information at this time. Flaherty offered no specific details on how the Pickering airport project would be financed; saying only that land had been set aside for a future airport. “It is very early in the process and no decisions have been made with respect to specific costs or the approach to financing and building,” Flaherty spokeswoman Kathleen Perchaluk said in an email. “Any future decisions will be informed by the interests and the needs of regional stakeholders and residents expressed during engagement and consultation activities that will take place over the coming months and years,” she added. But York University’s Lazar thinks Pickering would be a waste of money. Mirabel airport, about 55 kilometres north of downtown Montreal, opened in 1975, a year before the city hosted the Summer Olympics, with the expectation the airport would eventually serve 50 million passengers a year. But the traffic never materialized. Travellers opted to stick with the airport in Dorval, which is closer to where most Montrealers live. Mirabel closed to passenger traffic in 2004. The 40-year argument: A Pickering airport, or farmland? If there is anywhere left for Torontonians to find patches of bucolic, fertile farmland close to the city, it’s 50 kilometres or so east in Pickering. On a summer day, fields carpeted in hues of green spread from undulating back roads. Descend a little hill or corner a gentle bend, and a farmhouse can be found nestled in each fresh vista. Yet 18,600 acres of this area, acquired by the federal government in 1972, remains at the centre of a debate as vociferous as the land is calm, with Ottawa’s recurring plan to build a major airport in Pickering. Finance Minister Jim Flaherty’s announcement in June renewed a plan to develop an airport – a plan which has been in limbo for four decades. For a strong community of activists and local residents, the arguments against an airport are the same as they were in the seventies, with the added emphasis this time on protecting the area’s rich soil for farmland to feed Toronto. Yet, there are also plans to develop parts of the land for businesses, bringing further uncertainty, say activists. Born under the Trudeau government, the airport plans have been to build a second, large Toronto hub, initially a Toronto version of Montreal’s ambitious Mirabel airport – which is now widely considered a white elephant and used primarily for air cargo. By 1975, the protest movement People or Planes had galvanized opposition so strongly that the Ontario government backed away, shuttering the proposal and leaving the airport plans in limbo for decades. Now, land advocates and activists are gathering again in force – but this time, the focus is a little different. When People or Planes garnered widespread attention for its cause, people at that time had been expropriated from the land acquired by the federal government. Families were being moved, their lives uprooted. That’s less the case now. “We understood two things,” said Pickering resident and organizer Mary Delaney about the new iteration of the movement. “One: It wasn’t so much about people anymore, so People or Planes wasn’t really the point. It’s about land. Because after 40 years, the communities had been destroyed.” Like others on the federally expropriated land, she doesn’t own her family’s home or the land. The crux of Land Over Landings’ argument is that the area’s prime Class 1 soil, ideal for diverse crops, has been neglected and squandered in order to depopulate the land for a future airport. The land is vital and could be a valuable source of food for Toronto and the region. Land over Landings sees this as an urgent need. Mr. Flaherty, on the other hand, said he hopes to see the airport running by 2027. The government has been leasing land to farmers on short-term contracts, which discourages agricultural businesses from investing in diverse crops, even though the area is so close to Toronto markets and restaurants. The land is being used mainly for nutrient-depleting cash crops, such as corn to make ethanol. Similarly, Pat Valentine, vice-chair of Land Over Landings, has detailed in a series of photos the dilapidation of country houses due to years of neglect under the imposed rental system for properties. Mr. Flaherty has defended the renewed airport plan as being a balanced approach to the long-standing question over the land. As announced in June, 5,000 of the government-owned 18,600 acres is being rezoned and given to Parks Canada for the Rouge National Urban Park. Roughly 8,700 acres will then go for the airport, with the remaining land apparently going toward business development, people close to the announcement say. Most observers, however, see a giant question mark hovering over the plans. Representatives of Air Canada, WestJet and Porter Airlines all say that it is premature to comment on an airport which, if it comes, isn’t expected to be operating for more than a decade. Brian Buckles, a director of the Green Durham Association, who was expropriated from the land in 1972 and was a prominent member of the protest campaign in the 1970s, doesn’t see clarity at all in Mr. Flaherty’s announcement. “I think there is a lot of confusion here around what the announcement was basically saying,” he said, noting that Transport Canada officials haven’t indicated that development of part of the land is a foregone conclusion and that the department has been inviting public comment about how land not needed for an airport should be used. In a letter to Transport Minister Lisa Raitt, the Green Durham Association argues that 5,000 acres is in fact a reduction of the previous promise by the federal government to protect 7,200 acres, as the passing of provincial Oak Ridges Moraine protection legislation in 2001. In the meantime, new housing and land development may become as much of a pressing controversy as the airport. As Pickering’s mayor David Ryan said in an email, the province’s Central Pickering Development Plan in Seaton, a northern section of Pickering, is a development scheme already in the works in an area south of the airport land for up to 60,000 residents and 30,000 jobs. It is the extension of the provincial strategy of swapping provincial land in Seaton with privately owned land in Oak Ridges Moraine, in order to help protect the moraine. Mayor Ryan sees the Seaton development and the airport acting part and parcel. “While the two-to-one resident-to-job ratio may seem ambitious, we think the airport will play a significant role in helping to reach that 30,000 new jobs target,” Mr. Ryan said. The mayor said that he has never ran for or against the airport, but is more interested in making the best of Ottawa’s decision. He said that since 1975, the area has suffered from the uncertainty of what the federal government will do next. “The ongoing airport saga had created a 40-year planning void in the city of Pickering. No matter what decision was to be made, the city of Pickering was prepared to move forward and plan the best uses for those lands. Now that it has been decided by the federal government, we will leverage the airport to further our economic development and job attraction efforts,” he said in an email. However, the federal government has released no new business model for the airport. And despite Mr. Flaherty’s assertion of the need for an airport, the needs assessment report released by Transport Canada in 2011, which Mr. Flaherty cites to justify the airport, says that Toronto won’t need a new airport until 2027, or maybe not until 2037 if Toronto’s Pearson airport reaches capacity. It could take longer, or it may never reach that point. “What they say in their conclusion is that the government should hold on to the land if and when an airport is ever needed,” Ms. Valentine said. “In other words, the study is very ambivalent about whether this is ever going to be needed. Mr. Flaherty said it was going to be needed by 2027 … If you read the report, you find that’s not what it said,” she added. Posted: Thursday, September 5th, 2013. Filed in General News, News about Airports, Recent News.